New Year Resolutions? Electric Bikes Help Out! The excitement of the Christmas holiday is over and the winter blues are starting to set in. Rather than ending up with failed resolutions to “get fit” or “do more exercise” that often end up with a new bike discarded in the shed. Why not consider an electric bike? An electric bike is fun to ride and can take the strain out of hills and head winds. 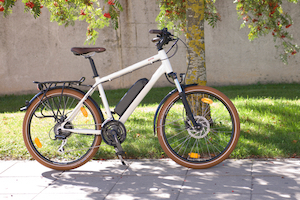 Surveys have shown that customers who choose an electric bike are much more likely to ride more frequently and to continue to use the bike after the novelty of a new toy has worn off. Or maybe the novelty doesn’t wear off! I certainly get the grin factor every time I go out on an electric bike! 2017 marks the tenth anniversary of starting Batribike and I for one still enjoy riding an electric bike, and it gives me that “electric bike smile” every time I set off down the road. Riding a pedelec or pedal assisted electric bicycle isn’t about giving up and letting the bike do all the work. The whole principle is of the bike and rider working together. Distances are easier to attain and hills easier to manage. Surveys say, and our own experience tells us, riders are likely to go out more often, and for greater distances. Government studies report that we get moderate exercise from riding an electric bike, all this can only be good for our health. So, grab that New Year resolution by the horns and test ride one of the 2017, made in Europe, Batribike range. You might just find yourself smiling as you ride up the road!